On the surface it may seem like the movie nine-dollar and ninety nine cents ($9.99) is another slice of life film, and watching the trailer (which you can find here) you may wonder why a movie that seems to be about everyday people was done using stop motion animation instead of live action. However within the first five minutes of the movie, we get a bloody red clay splattered wake up call that explains all. Nine ninety nine ($9.99) is animated so that the filmmakers can get away with their not so subtle sense of dark and twisted humor without grossing out the audience and send them running to the door. The movie's gruesome opening scene gets a pass because it happens to claymation characters and not real people. 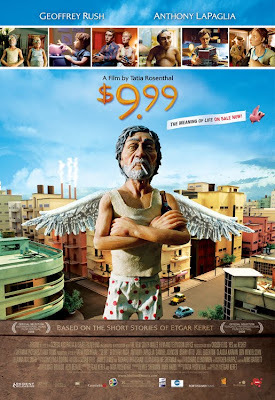 The movie is based on a series of short stories by Etgar Keret who collaborated with director Tatia Rosenthal to translate his work into a screenplay for the film. The movie explores follows a number of characters who all live in an apartment building, each trying to find the meaning to their own lives. The nine dollar and ninety nine cent ($9.99) title refers to the price of a book that the main character named Dave, orders to find out the meaning of life. And while the character may have paid out just under ten bucks for the 'Meaning of Life' book, the paperback that seems to have the real life changing value is the book about 'How to Swim Like a Dolphin' for Dave and his Dad. Some of the other stories involve encounters with a crass talking angel voiced by Geoffrey Rush who seems to have descended upon the apartment building to bum for cigarettes while helping guide a few of its citizens through to the next stage of development for their souls. Another story line features the figments of the imagination of a drug addicted resident, who struggles with leaving his bad habits behind him. While down the hall, a small boy learns that sometimes it's better to save the pig than break the bank for what's inside. All of these plots intertwine with a pair of brothers that work as furniture repo men while their father struggles to find some happiness in his desperate life. Nine dollars and ninety nine cents ($9.99) is at its best when it offers a warped "Twilight Zone"-like perspective on just how far a guy will go to change themselves just so they can earn the affections of the super model that moves in upstairs. The outcome is as funny as it is disturbing and helps wrap up the film which runs short at just under eighty minutes long. While it's fun to see an animated movie aimed at adults, and the use of the clay stop motion characters is a nice alternative to the endless computer generated movies out there, nine dollars and ninety nine cents ($9.99) does suffer from some pacing issues as it jumps from story to story and has such an awkward title that makes it difficult to talk about, and will have the audience wondering if the eleven bucks they spent at the movie theater to watch it is worth it. Waiting for my 'How to Swim Like a Dolphin' book to show up in the mail, for Movie Magazine this is Purple.